As promised last week, here is some amplification on one of my favorite museums, The Wallace Collection. 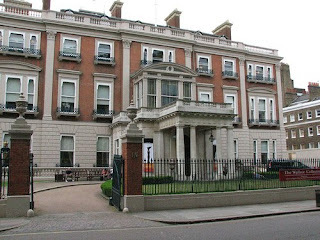 It is situated in the London town house containing the family collections of the Marquesses of Hertford and was given to the nation by the widow of Sir Richard Wallace in 1897. In the stately atmosphere of this unique museum I always feel that I am visiting the home of a wealthy aristocratic collector. I am particularly privileged to be able to wander through the collections on my own. 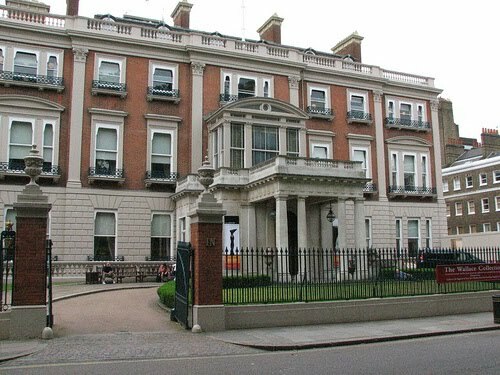 I was introduced to the Wallace Collection in 1965 when I was sent abroad by my family, between college and graduate school, to learn about art dealing from colleagues and attend The Study Centre for the History of The Fine and Decorative Arts in London. The Study Centre had been founded the year before by Erica O’Donnell and was to serve as a model of its kind. Students were taught in various disciplines by art historians and curators in front of the original works of art in the museums of London whenever possible. They included the National Gallery, the Victoria and Albert Museum (V&A) and, of course, the Wallace. This method was far better than the slides and black and white Targo prints I would later have as study tools at Columbia with only occasional reference to New York’s marvelous museums. I remember the greatest thrill was when John Cushion, a leading authority and curator of ceramics at the V&A seated us at the Wallace in a windowed alcove opposite the grand staircase and the huge Boucher canvases and spoke about the porcelains of the French Royal factory of Sèvres. When he was through with his formal lecture he would take us to look at the works themselves as the Wallace houses one of the greatest collections. Of course, ceramics are just part of the Wallace holdings. There are galleries of Renaissance bronzes and objets d’art much as you would find in a kunstkammer, French 18th century furniture and paintings by Watteau, Lancret and Greuze, not to forget masterpieces by Velazquez, Titian, Rubens and Rembrandt . Dame Rosalind Savill has been director of the Wallace Collection since 1992 and will retire from there later this year. She has been at the Wallace since 1974 and became assistant to the director in 1978. Having been a junior curator in the ceramics department of the V&A she continued her interest at the Wallace and became the great scholar of Sèvres porcelain. She has written the definitive 3 volume catalog of the Wallace’s Sèvres collection. As director, she has totally revitalized the institution without affecting its ambiance. In order to add a restaurant and twelve additional galleries including an auditorium and special exhibition galleries she has covered the court yard for the restaurant and the galleries below. The exhibition of Peter Marino’s bronzes that I mentioned in my last Missive was wonderfully shown in these new galleries. Do visit it when you are next in London it is as worth your time as the Frick is in New York.